With a Small group day ticket up to five persons can travel together as often as they want on the day printed on the ticket until 3.00 a.m. on the following day. 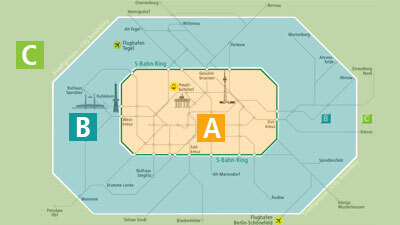 Small group day tickets to print are only available for fare zone Berlin AB (Berlin city area). If you want to travel beyond, tickets are available at ticket machines in underground stations or on trams, at BVG sales outlets and directly from the bus driver. Print tickets are only valid for the person named on the ticket and together with an official photo identity card (ID Card, drivers license or passport). Children under 6 years of age (a maximum of three children on ferries), prams/pushchairs, and luggage travel with the ticket holder free of charge. A reduced fare ticket is required for each dog travelling with the ticket holder. If you want to take your bike with you a bicycle tariff ticket is necessary.